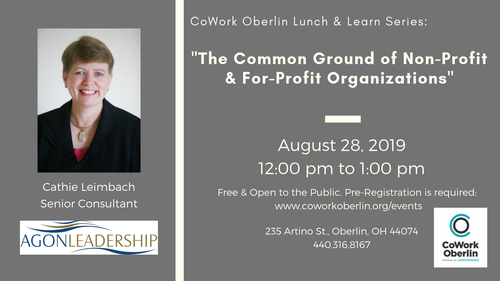 The Common Ground of Non-Profit & For-Profit Organizations - Aug 28, 2019 - OBP : CHAMBER : Positively Oberlin! It is often said that non-profit and for-profit organizations are very different creatures. However, they have a lot more in common than many think. They are both legal entities with a purpose, a board of directors, and people who work towards achieving their purpose. They have to follow the same employment laws. Both are expected to be fiscally responsible and are required to comply with federal and state laws that govern annual financial reporting. Both provide products or services and execute marketing strategies to attract clients. Contrary to many people’s understanding, non-profit organizations are even intended to be profitable. They are encouraged to accumulate profits over a few years until they have enough money in the bank to pay six months’ expenses. When non-profits have these financial reserves, they can pay their rent and their employees while they are waiting on their grant revenue from a Foundation or from administering a government program. They can continue to pay their expenses when there is a slump in donations. The primary financial difference between non-profit organizations and for-profit organizations is how their profits are used. The intent of for-profit organizations is to distribute their profit to the individual people who own the company for individuals to use as they wish. However, non-profit organizations are not allowed to distribute their profits to individuals. They have to use them to keep their organization financially stable, to provide additional products and services to their clients, or to help fund other non-profits. This session will further explain the many business functions required of both non-profits and for-profits and touch on some of the differences in how they might fulfill these functions. There will also be a question period to address your top-of-mind queries.